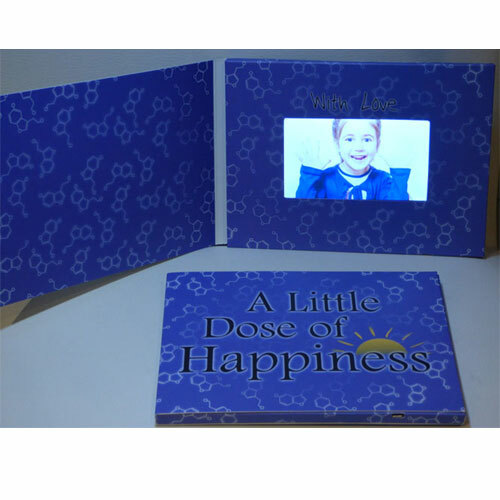 A Little Dose of Happiness Video Comfort Card is a card that has inside of it a 4.3 inch LCD video screen and high quality sound to provide up to 5 minutes of visual and verbal comfort for a loved one when a loved one cannot be present. The Video Comfort Card is quite diverse and can be utilised in a variety of situations, for example: simulated presence therapy for people living with dementia, a meaningful gift for a loved one, a gift for any long distance relationship and so on. A loving video message is recorded on a mobile phone, electronic device or camera and is transferred to a computer via the micro USB/USB cord provided. The Comfort Cards have 3GP, MP4, ASF, AVI video support, and the message can be updated with a new message by following simple instructions provided. There is space for the giver to write a personal message on the inner of the card.